In the hamlet of Mannried, near Zweisimmen, you will find the old school building. Many local people have fond memories of their old school days in this building. The cosy and stylish rooms as well as the friendly schoolmates and teachers helped to make schooldays pleasurable. Even today, after a rebuilding period which transformed the old school building into a home and guest house, the feeling remains the same. The rooms have undergone a soft renovation and still reflect the charm of the old school building. The warmth and hospitality of the owners remains as in the good old days. A rich and tasty breakfast using local products will be served. Located only 30 minutes drive from the highway exit “Wimmis”, Zweisimmen is an excellent starting point for hiking, biking, scooter rides and motorcycle tours. During winter skiing, sledging, cross country and hiking in winter wonderland, are activities to enjoy. The usage of a kitchen is possible upon demand. The room offers 2-4 bed places. Upon demand more bed places may be offered for families. TV, shower and internet access is available. The outdoor sport yard (including a trampoline and more) maybe used free of charge. 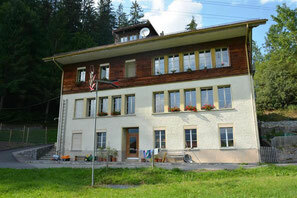 The house offers large surroundings and a great view towards the Rinderberg and the Saanenland. The time for handing out the key should be arranged in advance. INCLUSIVE: Electricity, heating, water, parking, breakfast, kitchen and bathroom towels, bed linen, internet access W-LAN, final cleaning and visitor's tax. Rich breakfast with local products included.